Fifty-eight years after they were addressed by its then leader Hugh Gaitskell to the 1960 Labour Party conference, opposing its move towards the hard Left and its embrace of unilateral nuclear disarmament, these words need once again be addressed to a party conference. This time to the Conservative Party conference, and moreover not by its leader, but to her. She continues to cling not only to Chequers as the sole Brexit option she is prepared to consider, but also, incredibly, to Olly Robbins, her thoroughly discredited No 10 Brexit adviser, whose brainchild Chequers was, and on whose ‘expert’ advice that the EU would accept it she persists in relying, to the exclusion of all others. Yet not merely other, but superior, alternatives are being urged on her by allies and opponents alike, which both better reflect the desire manifested in the Brexit vote for clear political, judicial and economic separation from Brussels, and give better opportunities for an independent post-Brexit Britain to forge new trading links around the world. The Canada Plus arrangement gives us total freedom of control over immigration policy, and independence from the EU’s ‘Common Rule Book’; Chequers gives us neither. The Institute of Economic Affairs’ Plan A Plus maximises the scope for eliminating damaging tariffs and regaining control over our fisheries, as well as facilitating new Free Trade Agreements with the world’s dynamically growing economies outside the sclerotic EU; Chequers keeps us tied into it as closely as possible. Yet they fall on deaf ears. May has her Chequers Plan, she insists that nothing else is acceptable, and that, for her, is that. 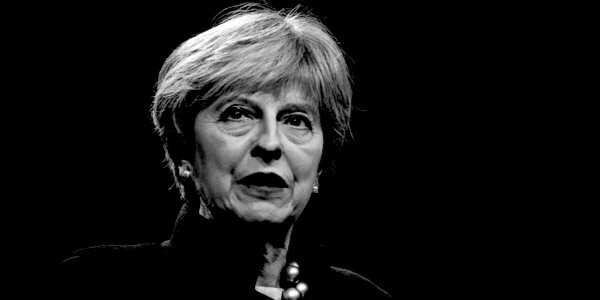 To the evidence both that it is less popular than No-Deal, and that its unpopularity exacerbates that of herself and her party, she is impervious. But there is worse to come. May’s obdurate adherence to Chequers is being compounded by her acceptance, if not endorsement or even something more, of a grotesquely cynical ramping up of Project Fear. The scaremongering operation born out of the Treasury’s pre-Referendum antipathy to Brexit is being pushed again by May in full Stockholm Syndrome mode – on new ‘expert’ advice from her preferred source? – but this time against a No-Deal Brexit as an alternative to Chequers, as part of a deliberate ‘Chequers or Chaos’ strategy. After instructing them to spend their summer holidays touring Europe to drum up support for her Chequers Plan, last month May was ordering ministers to stress to the public that there was no alternative to it. Or try the Association of British Insurers’ warning that it would become illegal in the event of a No-Deal Brexit for insurance-based pensions to be paid to British recipients resident in the EU. Fortunately, fairly easy to demolish. Then, last week, May’s government theatrically appointed a Food Supplies Minister ‘to oversee the protection of food supplies in the event of a No-Deal Brexit’. Such an appointment has previously been confined to wartime. In summary, we have a Remainer Prime Minister sticking resolutely to a Brexit plan already rejected out of hand by an EU no doubt confident that further concessions can be wrung from her, and shunning all other, and better, alternatives. We also have a Remainer Prime Minister colluding in, if not directing, a co-ordinated attempt to frighten the British public into accepting it. It’s perhaps hardly surprising that 56 per cent of those polled by Sky Data think Brexit will be worse than expected. The Remainer-dominated media and political elite, including even the Governor of the Bank of England, have done little for the last 28 months except attempt to talk the nation into a state of panic. Mrs May must be so pleased. Were Brexit the sole source of the Conservatives’ predicament, the crisis might – just – be containable. But overlying May’s Brexit shambles is the party’s ideological vacuum, epitomised by the instinctively statist, authoritarian May, devoid of any discernible guiding philosophy, personality or leadership ability, and of which her self-inflicted Brexit shambles is arguably merely a part – its apparently total inability to come up with any ideas, vision or policies to counter the 1970s-throwback, reheated hard-Left socialism of Corbyn’s Labour. The Conservatives, observed Ryan Bourne accurately in the same paper, have spent so long agreeing with Labour’s negative portrayal of our economic system, and even imitating its policies, that they have deprived themselves of any effective criticisms of them. Ministers such as Philip Hammond are incapable of fighting back other than with Left-wing prescriptions such as surreptitious tax rises or expensive new spending projects, noted The Spectator editor Fraser Nelson, so that Corbyn is actually leading the nation’s intellectual conversation. The Conservatives are functioning as Corbyn’s useful idiots: years of failing to make the case for basic liberty and the free enterprise system, of stealing Labour policies in pursuit of electoral advantage, have left them unable to explain why Corbyn is wrong, fulminated The Spectator editorial this weekend. And when usually loyal Conservatives such as Charles Moore and Tim Montgomerie validly ascribe culpability for the party’s ideological paralysis to May and call for her to go, in effect saying, rightly, that she is all but guaranteeing the advent of a hard-Left Labour government led by Corbyn and McDonnell, her days are surely numbered. So over the next few days in Birmingham there will be parallel Brexit and non-Brexit battles taking place. The unofficial but never far from the surface impending leadership contest is almost immaterial, because the ideological struggle over the shape not only of Brexit but of Conservatism will determine its outcome. Will the party continue on its Leftward drift, preoccupied with fashionably politically correct social-justice and identity politics, and convinced that the way to stop full-strength Corbyn economically is to offer diet-Corbyn instead? Or will it somehow re-discover the moral and intellectual firepower to oppose Corbynism absolutely and offer a distinctive and optimistic vision of a freer, less-taxed and better-off society? For anyone wanting the latter, an irredeemably intransigent, incompetent, inflexible Theresa May, a disaster for her party, the country and arguably democracy itself, and who ideally should not even be giving the leader’s speech on Wednesday at all, must be forced to declare that it will be her last. If ever there were a need for a repeat-in-reverse of Macmillan’s Night of the Long Knives, it’s now. Drastic though it is, the present circumstances do justify a palace coup – whereby May is told, in no uncertain terms, that the game is up: that she cannot lead the party through Brexit, much less into the next General Election, and that her only alternative is to resign, with effect from the conclusion of her speech, in favour of a pro-Brexit caretaker Prime Minister. If the party, despite its current dire ideological and political predicament, yet again prefers to close ranks, eyes and ears, and contrives to hold a synthetically orchestrated, reality-ignoring conference, and if the pro-Brexit, anti-May dissenters yet again recoil from openly mounting a challenge, both to her conduct of Brexit specifically and her party leadership generally, then a Corbyn government is a near-certainty, and they will have no one but themselves to blame. That modern-day equivalent of Gaitskell’s ‘fight for the soul of the party’ needs to take place. In Birmingham. Here and now.